What makes these hearing devices different from other hearing aids? Who can use TV hearing devices? What is a TV Hearing Aid? A TV hearing aid is a device that has been specifically designed to help people to hear their television better. There is a lot of demand for this kind of device, because when people start to lose their hearing, one of the first thing they struggle with is watching the TV. What makes these hearing devices different from others? Hearing devices that are specifically designed to be used with televisions work in a slightly different way from devices that are designed to be worn in the ears for daily use. They specifically enhance speech sounds and tone down background noises like the soundtrack. Not to the point where you cannot hear it at all, but enough so that the dialogue is clear. Regular hearing aids, worn in the ears enhance all sound. This allows people with a hearing impairment to hear cars approaching and things like that as well as speech. As you can see when you are out and about hearing all sound is important. However, it can make it hard to hear a conversation clearer. When you are watching the TV to follow the plot you need to hear the dialogue clearer and need to hear the other sounds only in the background. Television hearing devices allow you do this. How do TV Ears Hearing Devices Work? There are two main types of TV Ears hearing aids. Some you wear in your ears, others look a bit like a home theatre system or standalone speaker. Both types of devices work by enhancing the sound of your television. Essentially, they work primarily by cleaning up the sound and enhancing the frequencies, which most people with hearing loss cannot easily hear. Once the sound has been cleaned up, it is crisper and much easier to understand. This fresher cleaner sound is then amplified and delivered to the room. In families, where everyone is suffering from hearing loss the sound can be delivered into the room via a high quality speaker. In those families where only some watchers need an aid to hear the television the headphone type device is best. The configuration of these headphones varies. For comfort, most firms make them so that they fit in the ear and can be worn hanging down. This means that you can rest your head on the sofa without the headphones digging into your scalp. Who can benefit from Using TV Hearing Amplifiers? One of the nicest things about this type of hearing amplifier is that anyone can use them. In many homes members of the family who do not have any problems with their hearing end up using them. It allows the kids to enjoy listening to their favourite band while watching them on the big screen without disturbing anyone else in the house. Some people who live in flats use them to ensure they do not disturb their neighbours. However, they are really designed for people with hearing loss to use, and it does not matter what the cause of the hearing loss these TV amplifiers will make a positive difference. Will TV Ears Work With any TV? TV Ears makes devices that will work with both analog and digital TVs. They work with most makes and models. OK, now you know a bit more about TV listening devices we are going to tell you about the five different versions you can buy. They are all made by TV Ears, who, as the name of their company indicates, only makes hearing devices for TV users. One of the best places to buy TV Ears is via amazon. The fact that this firm has been working only in this field since 1998 is why they make such good TV hearing enhancement devices. They have a deep understanding of the technology behind TV audio. Knowledge they have used to produce products that make watching the TV a joy again for those with impaired hearing. If you prefer headphones and have an analog television, you need the TV ears analog headset. These headphones enhance the sound of speech while lowering the level of background noise. 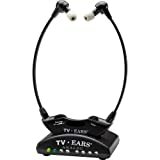 Connects best to Analog TVs - for Digital TVs, look for TV Ears Digital Headset System. Voice Clarifying Circuitry with twice the Power at 120 db. Connects wirelessly to your analog TV. Television and headset volume function separately. Turn up your headset volume while others mute or set the television volume to their level. Background noise reducing foam ear tips ensure maximum volume for the headset. 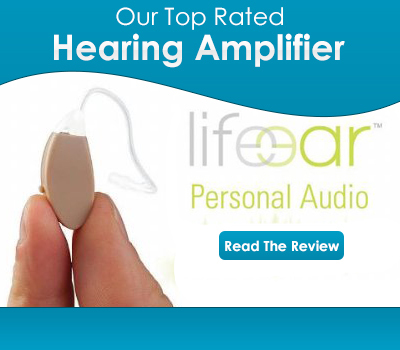 It is a great system because only the person with the hearing loss needs to hear the enhanced sound. The television can operate at the volume preferred by the other people, so effectively you get two types of audio being delivered to those watching the TV. If you fancy watching TV at night or early in the morning, you can do so without any danger of disturbing anyone else in the home. This applies to everyone because these headphones can be adjusted for use by people without any hearing issues. To use all you need to do is to connect the transmitter to your TV. If you prefer you can plug it straight into your TV cable box or satellite box. All you need is an analog port on your TV, or box. The system is wireless and is very compact. You can use the transmitter as a cradle for the headphones when they are not in use. This is great because you always know where they are and do not run the risk of them being sat on and crushed. Because these headphones are worn hanging from the ears rather than sitting on the head they are very comfortable. They do not pinch and will not ruin your hairstyle. If you start to nod off while watching TV, they will not wake you up when your head lulls back against the sofa or chair back. These headphones are lightweight, which means once you have been wearing them for a few minutes you easily forget you are wearing them. However, if you prefer you can wear them like a regular pair of headphones. The bar is narrow and lightweight, so these headphones are far more comfortable than most other kinds. Comfort is enhanced by the fact that they have angled foam earpieces. These blocks out all unnecessary background noise, which further enhances your listening experience. 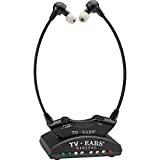 Given the fact that more and more TVs offer digital sound it is now possible to buy a headphone set that is specifically designed to work with digital televisions. This system allows you to benefit fully from the enhancements offered by modern digital sound systems. They are compatible with all TVs that use Dolby, SRS or PCM standards. Importantly, they work independently of your televisions speakers. These headphones look the same as the analog headphones and offer the same benefits. However, because the components used inside the headphones are lighter they are even more comfortable. They weigh just 2ozs. Many audiologists recommend this particular form of TV hearing device. The next product in the range is the dual digital headphone system. This is the most powerful TV listening headphone system. It features twice the number of light emitting diodes of the single digital system. Instead of one set of headphones, you get two. This is great for couples who are both losing their hearing. The price is also cheaper if you opt to buy two on amazon. The speaker system is essentially a wireless television speaker. It is designed to pick up the audio from the TV, clean it up and deliver it at a comfortable volume into the room. The system uses Voice Clarifying Circuitry that has been specifically designed to enhance the dialogue. You can turn the TV volume right down or turn it off completely if you prefer and enjoy the clean, clear and crisp sound produced by this wireless speaker system. It is designed to fit on a shelf or a table near the TV. This gadget looks good and blends in well with modern TVs. Typically, you get 90dB of volume delivered across the room to where you are sitting. This is loud enough for most people with hearing loss to hear, without it being overwhelming for everyone else in the room. To install it all you need to do is to plug it into your TV. It works with both analog and digital televisions. If you prefer you can plug it into your cable or sky TV box. The full range of TV ears are available on amazon and where possible, we always recommending buying from amazon. With amazon you get buyer protection and if anything goes wrong you know exactly who you need to go back to.